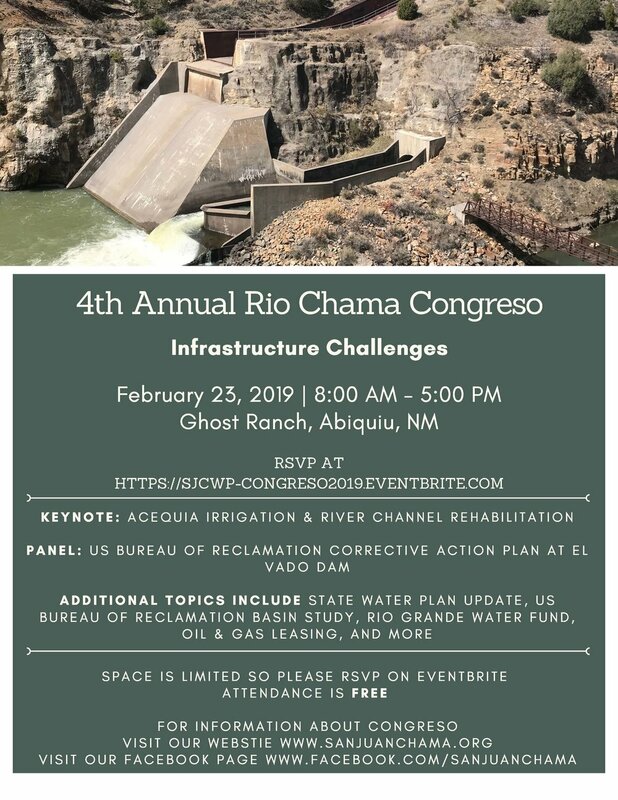 4th Annual Rio Chama Congreso - Registration Open Now! Sponsored by the San Juan-Chama Watershed Partnership, the 4th annual Rio Chama Watershed Congreso is to be held February 23, 2019 from 8 am to 5 pm at Ghost Ranch in Abiquiu, New Mexico. The congreso concept is that collaborative decision-making can combine local knowledge with scientific management to sustain indigenous cultures, provide educational and economic opportunity for young residents and protect our resources. Last year’s event explored a dozen river and watershed restoration projects that have potential to improve the quality of life for all residents-ranchers, villagers, and recreationists who rely on the Rio Chama. This year’s theme is “Infrastructure Challenges”. You are invited to participate! Together with students and other citizens, agencies (Forest Service, Game and Fish, State Engineer) and non-governmental organizations (NM Association of Conservation Districts, Chama Peak Land Alliance, Rio Grande Restoration, and others) help to decide how to best address our water and land management challenges in the Chama Basin. Please SHARE this invitation and if you find others in your community or agency are also interested, by all means urge them to register. There is no charge to participate and lunch is provided. More information, including a full agenda, will be made available on the San Juan-Chama Watershed Partnership website prior to the event.